Rich in phytochemicals such as antioxidants and phytoestrogens. These seeds look similar to alfalfa and has a mild sweet flavour. 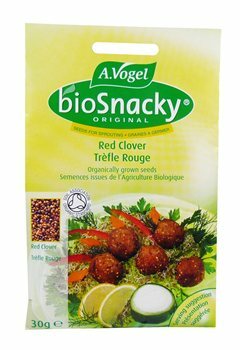 Grow your own crisp sprouts every day with original BioSnacky. Red Clover contains phytoestrogens called isoflavones, thought to be helpful for symptoms of the menopause. The delicate taste gives a distinctive flavour to vegetable dishes, soups, salads and many other dishes. The sprouts are an excellent source of vital nutrients and contribute to a healthy, balanced diet. They are easy to grow. The exceptional quality of the seeds guarantees the best growth when correctly used in bioSnacky germinators.